Just a few ingredients that result in a rich savory dish. Served with Jasmine rice and summer squash. Doesn't get much better than this. The base for this dish is the caramel sauce, so you need to start there first. 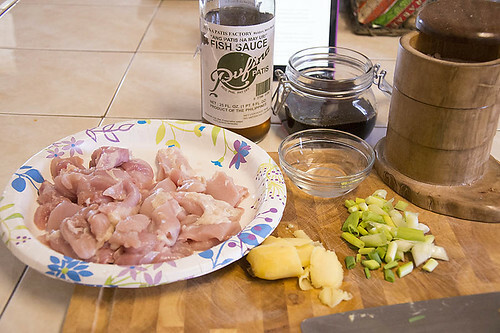 chicken, ginger, fish sauce, water, salt and scallion. That's it. Now, you are going to be better than I am about reading a recipe_ALL_the way through before starting. As you can see I added the scallions in the beginning when according to the recipe, they are the garnish at the end. Tasted great anyway, but you don't always luck out like that. 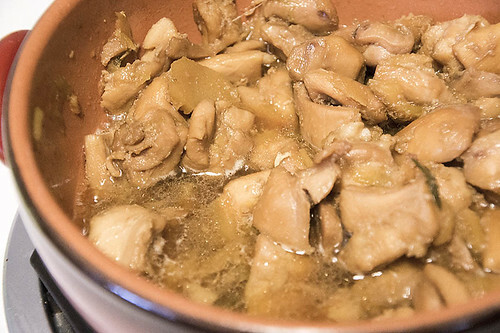 In the pot, I used a clay pot, add the chicken, ginger, salt, fish sauce and water. Cover and simmer over medium heat. The sauce will increase as the chicken cooks and releases it's juices. You just have to have rice for all that delicious sauce. sauce, salt, and water and stir to distribute everything evenly. 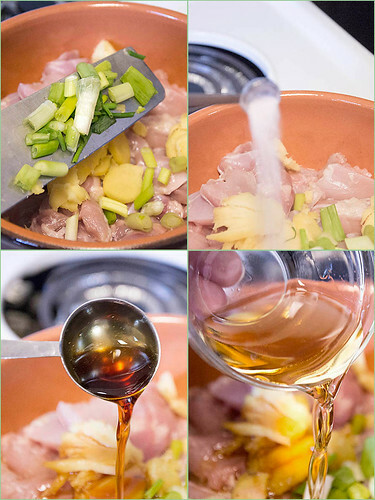 Cover and bring to a strong simmer over medium heat. Stir again to break up the chicken pieces and replace the lid. chicken is evenly exposed to the sauce. will boil vigorously. The sauce will increase in volume as the chicken releases its juices. If the contents threatens to boil over or the lid rattles, lower the heat. or until the sauce reduces and the color deepens to a rich reddish brown. Remove from the heat, cover, and let rest for 5 minutes. NOTE This dish may also be prepared in a small (1 ½-quart) clay pot. just a few ingredients yet yielding a savory result. flavor of the bittersweet caramel sauce, a Vietnamese staple. cooks, but it still delivers a mild sharpness to the finished dish. Americans, now use boneless, skinless chicken thighs. 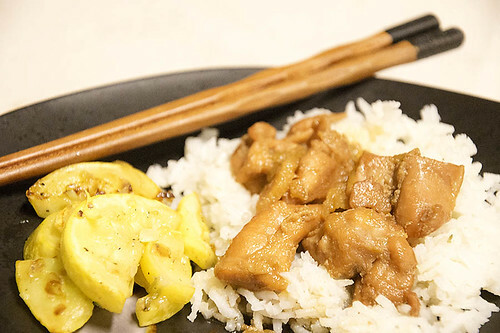 Serve with lots of rice to sop up the sauce.